FOREVER LOST. What was once an adorable novelty item is now gone. Not only did I receive my luggage in a worse condition than when I last saw it at the check-in counter, but I had items stolen on two occasions. Who would be happy to retrieve his luggage with one missing wheel? I'm just happy my luggage had a spare one on each corner! Initially, I could not determine with utmost certainty if it was the baggage handlers from NAIA Terminal 3 or the ones at Taipei airport who mishandled my luggage, leading to some visible, irreversible damage and a missing wheel. 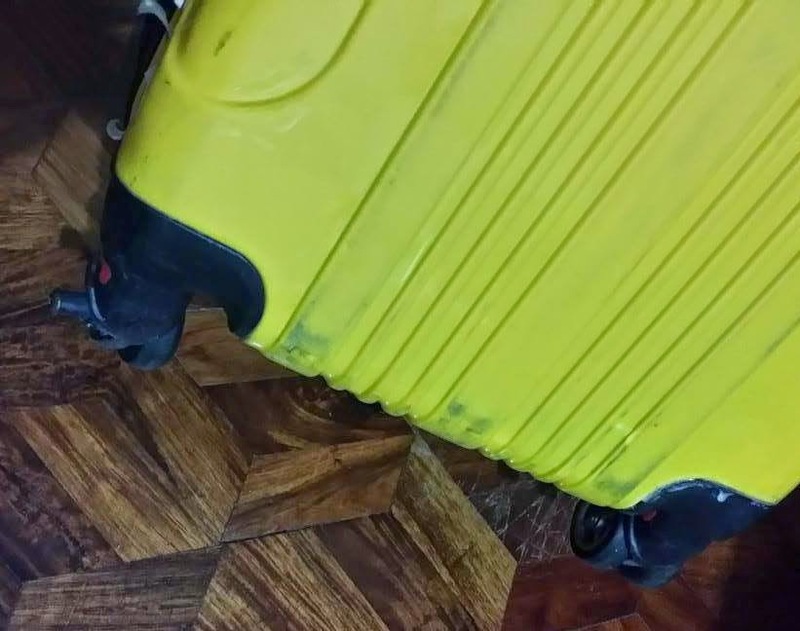 But since the exact same thing (missing one wheel upon retrieval) also happened to the brand new luggage of a friend who took a Singapore airlines flight from Terminal 1, I’m guessing the culprits were the local handlers - being the common factor. Luggage wheels do not just come off. The only explanation behind it is if it was carelessly thrown around and the impact caused the damage. But what I am sure of is that local baggage handlers are those who committed theft against me. Since travelers should check-in at least 45 minutes before their flight, baggage handlers at one’s departing airport have the opportunity to act on their malicious intentions. They have sufficient time to take from luggage, that should have been in their care, whatever it is they choose to keep for themselves. On the other hand, baggage handlers at one’s destination airport are in a hurry to unload cargo from the aircraft and into the baggage carousel where passengers are waiting, thus minimizing any chances of theft. Luckily, I haven’t experienced retrieving my luggage with the zipper open and stuff inside missing unlike many others have. Sept 2013 – I checked in my luggage for my Asiana Airlines flight to Incheon, Seoul at NAIA Terminal 1. Being naïve, I simply hooked the said keychain unto a zipper tab. It was already too late when I noticed it was missing upon my arrival in Seoul. Feb 2014 – I was looking forward to purchasing the same keychain on my AirAsia Zest flight from Shanghai to Manila. I was disappointed to discover that the sale of this particular merchandise has been terminated for flights to and from the Philippines. Thankfully, a few weeks later I had onward flights from Kuala Lumpur aboard AirAsia X and was able to buy another one for myself. Jun 2014 – Our party was at NAIA Terminal 3 for our Cebu Pacific flight to Taipei. We weren't able to maximize the weight of our prepaid baggage so I resorted to checking-in mine as well to fully utilize what has been paid for. This will turn out to be a huge mistake. Thinking I had learned my lesson, this time around I ensured that the keychain was thoroughly secured through a series of locks and key rings. So I was really surprised and angered to find it missing once again upon retrieving my luggage in Taipei. The tenacious thief handling baggage in NAIA was simply intent on becoming the new owner of this clearly much sought-after item. This is when I became 100% sure that my keychain was in fact stolen from NAIA on both occasions, because there was no way someone could get it off without having enough time to put much effort into it. But luckily, the opportunity to acquire a replacement came sooner than I thought, in the form of my next flight a few days after the previous one. I was pleased to see on the in-flight menu of my Peach Air flight from Taipei to Osaka that they were selling a similar item at only 500 Yen apiece. REDEMPTION. Even though I lost my second tag upon arriving in Taipei, the airline I flew with when I left Taipei for Osaka happened to be selling a similar item.